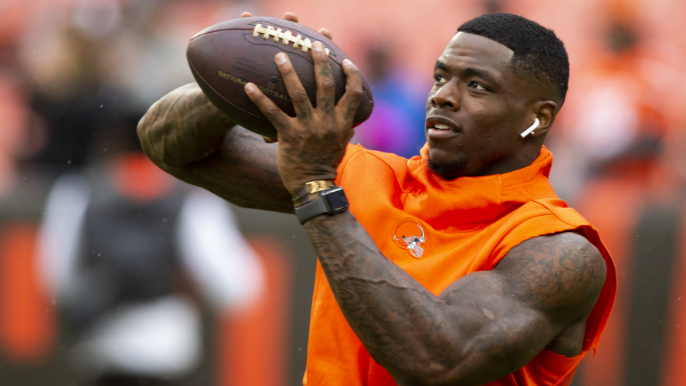 According to multiple reports, 49ers general manager John Lynch kicked the tires on Josh Gordon last weekend, after news that the Browns were looking to trade the former first-team All-Pro. The 49ers ended up backing out of a potential deal, and Gordon was ultimately dealt to the New England Patriots for two late-round draft picks. Lynch spoke for the first time about pursuing Gordon when he joined Tolbert & Lund on Thursday afternoon, and explained what factors the organization weighed when deciding whether to bring him in or not. 49ers head coach Kyle Shanahan coached Gordon for a brief period of time during the 2014 season, when he served as the Browns’ offensive coordinator. Gordon played in just five games that year after he was suspended for a DUI. Gordon would play in only five games the following three seasons for repeated violations of the league’s substance abuse policy. “I think in that situation, like any situation, if there’ s a chance to improve your team you always look into it. But in certain situations, particularly when you have knowledge of a player, you sit back and you weigh it, and sometimes it’s intriguing but then sometimes, particularly when you have knowledge the more you look into it, you know what, we’re going to stay away from that. Listen to the full interview below. To hear Lynch on Gordon, start from the beginning.